You've seen the image before, a bunch of nerdy NASA dudes sitting in front of monitors while the countdown over the loud speaker hits zero. 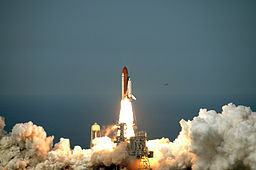 The flames burst forth from underneath the shuttle lifting it high into the atmosphere. Just as the shuttle breaks through the exosphere the nerd heard throws back their chairs and jumps for joy cheering and celebrating another successful launch and exploration of space. Kevin Honeycutt, a Macul Keynote, talks about launching kids, inspiring their goals and ambitions and fostering their whole growth as an individual. I appreciate Kevin's candor and the way he expresses his thoughts. He has a way of connecting with my heart when he speaks about reaching out and teaching the lowly and marginalized student. He does an incredible job of reminding teachers that it is not about the technology, but rather, the relationships we hold with students and how those relationships foster creativity, individualization, and self esteem in our young people. One of the colleagues I attended Macul with, Shawn Jacob, is really good at this as well. I deeply admire his classroom management strategies and the efforts he makes to keep kids and curriculum moving in the forward direction. He shared with me a few stories of seeing his own students launch and you can tell these are the stories that fuel him and keep him teaching. Listening to both Shawn and Kevin reminded me of how much I miss the classroom and being connected to kids. They also reminded me of a few important rules in life and teaching. Kids need you/us. They will never tell you this. For as much push back as you get as a parent, coach, or teacher the bottom line is kids need you. They may not admit it now but most likely there will come a time and place when they will. They need you to believe in them, hope for them, inspire them, push them, support them, and most of all set boundaries for them. Adolescence is a time in ones life that can be similar to a row boat in the middle of a wavy ocean. Adults can help students navigate their way back to shore and offer sense of security amidst the turmoil. This was a great reminder to get out from behind the computer, take some focus of the data, high five a student in the hallway, go out of your way to do something for a kid that no one else would do, and just invest in a student's being well enough to the point that they burst forth from their pad and launch! Posted in leadership, Macul, student work, teaching . Bookmark the permalink. RSS feed for this post.